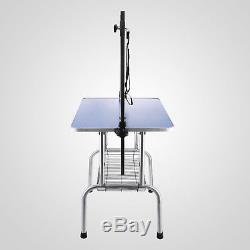 Dog Cat Pet Grooming Table Portable Foldable Bench Dual Loop Height Adjustable 120cm. This Home Ready Blue Pet Grooming Table is a must have tool in order to give your loved pet the groom they deserve in order to make them look better than never! It not only makes them look great, but it also helps pet owners perform a much better as it really makes life easier with a table! 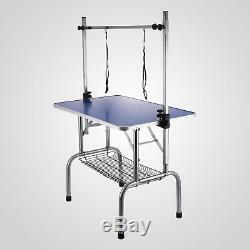 The table is also very easy to assemble and it can be dissembled once finished using if space is limited. The boards is made of high quality high density waterproof board with a non-skid rubber vinyl textured surface which is also scratch and slip proof so it is safe for your pet as they are able to stand stably. 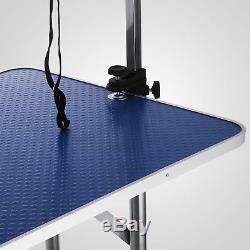 The edges of the table are rounded for safety in case you or small children hit the corner of the table. 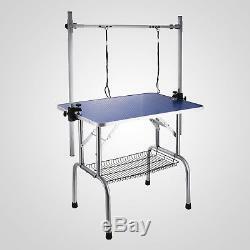 The table comes with a clamp on height adjustable grooming H-frame with 2 security nylon grooming loop so your pet can stay in a comfortable position while you work on it. The table frame is made of high quality durable stainless steel and the legs come with anti-slip rubber in order to add stability to the table. There is also a convenient basket under the table to store tools in order to make grooming more convenient. 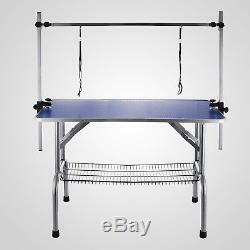 This grooming table is great for your pet dog or cat. You can reach him easily for bathing, trimming, drying, grooming or other things you want to do. Our product is fine designed and the table is ribbed rubber surfaced which can ensure the safety for your baby pets. 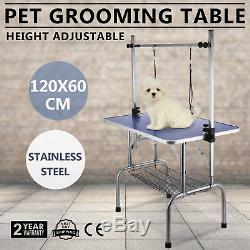 If you are tired of running around your pet or leaning down to reach it when grooming, this table will definitely help you make grooming an enjoyable time with your loved pet! Grab one of our tables now or you may miss it out! Come with 2 matching grooming loops. 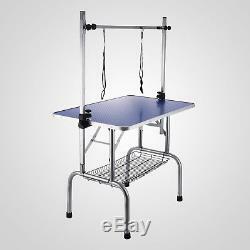 Easy to assemble and fold for pet shows. Waterproof board with MDF surface makes cleaning easy and gives comfort to your pet. Scratch and slip proof surface ensures pet stability in order to make grooming smooth and efficient. Rounded edges for safety purposes and easy to clean. 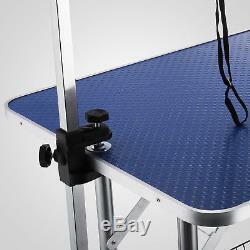 Includes a clamp-on adjustable grooming H-frame with 2 security nylon grooming Loop. Convenient storage basket under the table to store tools to make grooming faster. Stainless steel tubular legs with rubber so it adds stability and makes the table more stable while grooming. 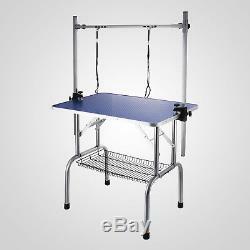 Material: MDF(Tabletop)+stainless steel(clamp-on twin grooming arm)+iron(mesh)+stainless steel(frame). 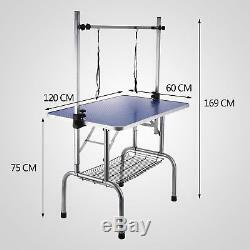 Height(leg to table): 75cm. As a leading and emerging company in manufactory and exporting business, we are specialized in Business and Industrial Products, Sporting Goods, Pet Products, Home and Garden products for more than 10 years. We believe that it is our vision and mission to provide innovative products with best service and competitive price to satisfy you. Our goal is to make sure that you can find exactly what you are looking for and make it easy for you to place your orders. If you have any changes, pls inform us. These charges are the buyers responsibility. If you need to return, please check twice to confirm the item not work and contact our customer service representative, let us know the detailed problem and send us some pictures for confirmation. Please make sure that item has NO man-made sabotage. A: The item ships from Sydney, AU. A: Please log on your account. Q: How do I return an item? Please contact our customer service before you return an item. The item "Dog Cat Pet Grooming Table Dual Loop Height Adjustable Anti Slip 120cm Salon" is in sale since Wednesday, May 31, 2017. This item is in the category "Pet Supplies\Dogs\Other Supplies". The seller is "happystoreshopping" and is located in Sydney. This item can be shipped to Australia, all countries in Europe, United States.